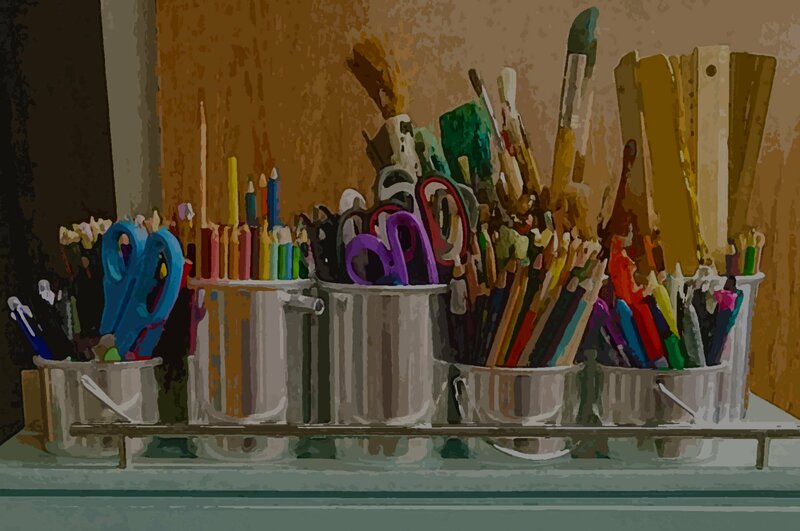 What is Cognitively Guided Instruction? Why do we do it? The response was inspiring, thought-provoking, and humbling. Inspiring because the ideas shared highlighted the wisdom and commitment to young people. Thought-provoking because the response pushed me to reconsider my own ideas of CGI. Humbling because it reminded me about the power of collective work and how even in the most challenging times for education, together we can push back and work to change the status quo. 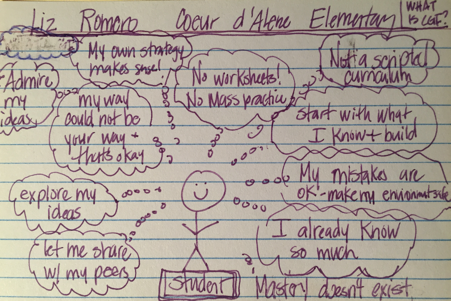 Before sharing what the group came up with, I want to explain why I began this conversation. Over the last year I have found myself needing to define or position CGI in particular ways. As I considered how I might do this, I recognized that CGI is not mine to define. CGI is not mine. It’s not even Tom Carpenter and Eliz Fennema’s. And it never has been. CGI is not the same as it was over 30 years ago when it began. CGI continues to evolve because of the folks who are engaged in the work—and this includes teachers, administrators, students, and their families. 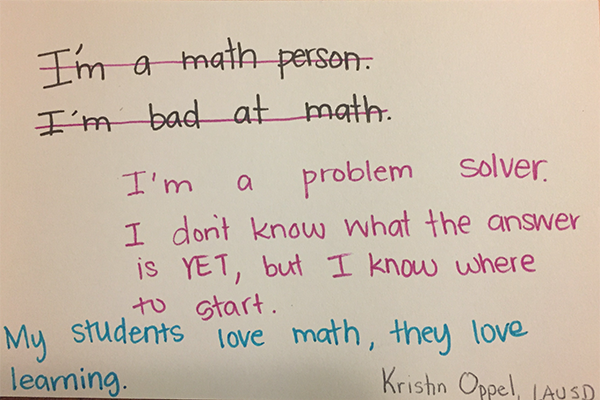 It even includes those who may not attach the CGI label to their work but seek to hear and support young people’s mathematical voices and leverage them to support learning. Because of this, the definition of CGI can change from year to year. Its definition can’t be owned by any one person. CGI is defined by our collective action. At times, it seems important to pause in that work and take note of where we are as a community, to make public our views so we can discuss, to challenge and move them forward. 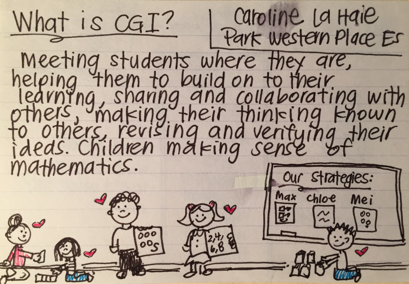 As we get ready for our biennial CGI conference in Seattle, it seemed like a good time to pause and consider: What is CGI and why do we do it? 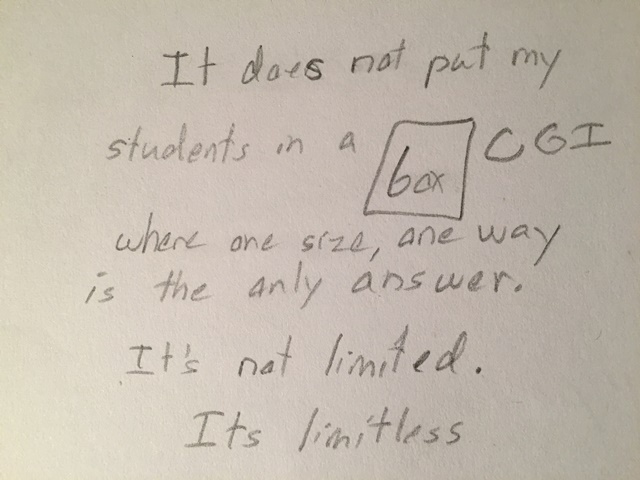 I wish I could share all of the hundreds of teacher responses, handwritten on index cards. I am going to try here to do justice to the collective responses, choosing ones to share that are representative of the whole while still acknowledging the ideas of each person who participated in the conversation. 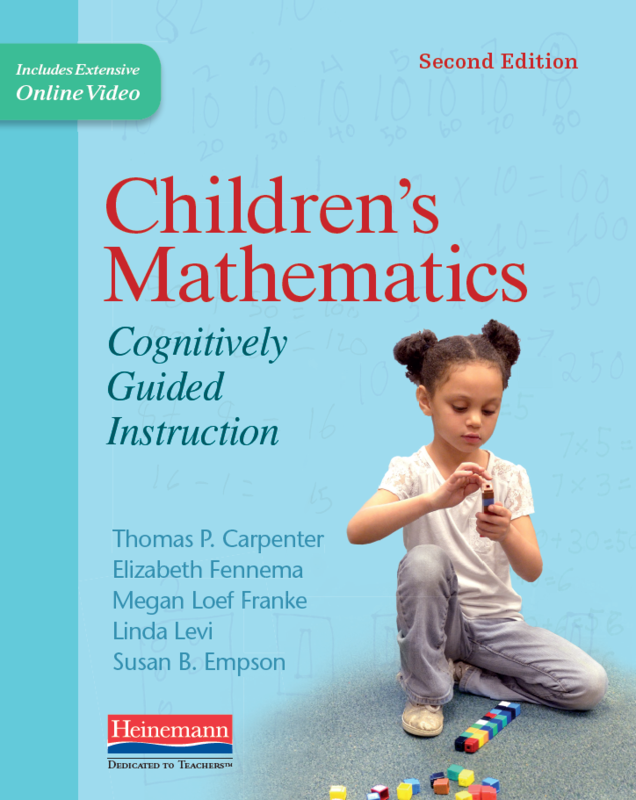 You will not be surprised to hear that the responses to “What is CGI?” centered on students and their mathematical ideas. Participants’ responses went beyond these ideas and overwhelmingly talked about empowering their students, building relationships, and competence. They discussed their own learning. They discussed curiosity, joy, and hope. I wonder how each of you would define what CGI is and why you do it. Please consider sharing your thoughts about and experiences with CGI in the comments section below. We want and need to continue our collective conversation and honor the variability, the commonalities, and the power of our learning together. This post was written by Megan Franke with Cotsen Alumni CGI Conference Participants. Megan is Professor of Education at the University of California, Los Angeles. 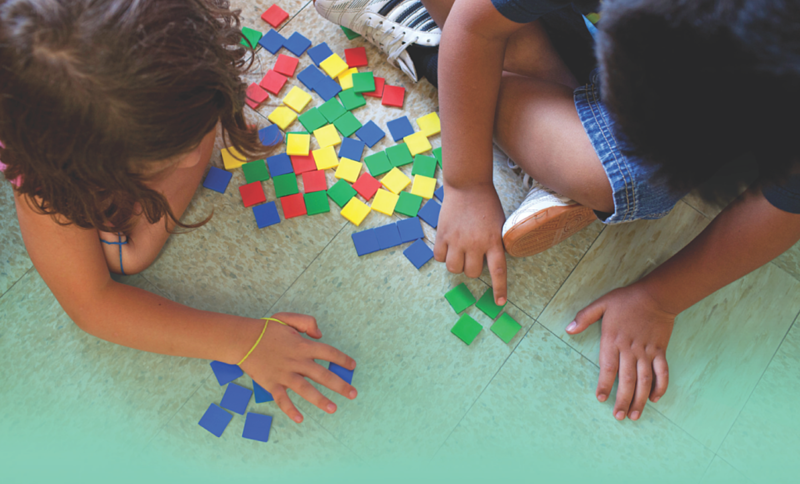 She is the coauthor of Children's Mathematics and Young Children's Mathematics. Follow her on Twitter @meganlfranke.